For the best part of a year in the early 1980s I lived with my then girlfriend in the wee village of Crail in the East Neuk of Fife. Meg was in her final year of university — studying French at nearby St Andrews — and I was doing what I often did when given the opportunity; I was acting the writer. The only heating in our small dwelling was from a coal fire in the living room. This also served to heat the hot water. During the worst of the winter, we ended up putting on more clothes to go to bed, the bedroom being so cold. The flat itself was like a raised bungalow attached to the back of a much older house on Crail’s high street. It was a modern build with thin walls but the fact that it was raised above a large cellar meant there were decent views from the back door — approached from a steep climb of steps from the narrow wynd between the houses — and the bedroom window to the shore behind the house. And it was to the shore that we went every morning to scour the beach for wood for the fire. Stormy nights always presaged a good haul. Often, after such a night, the sky was clear and the water calm, as if everything was resting, either gathering strength for future exertions or having boiled the anger from its system. It was fun to walk the shore with Meg because she knew the names of birds and plants. Although she was the product of the city, like me, she had had a father passionate about nature, with whom she had walked the hills around Edinburgh. Where I could point and say ‘gull’, Meg could identify Skuas and Fulmars and Herring Gulls. She could even tell me that Skuas and Fulmars were not really gulls. 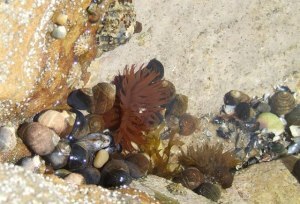 The shore at Crail was also rich in sea anemones, their compact fleshy purple so obviously phallic in the clear water as they clung to the side of ricks. I identified them immediately as fellow Hearts fans because of the colour and was happy to discover a like-minded group so close to where I lived. I was thinking of Crail and the way Meg identified plants and birds when reading a chapter from “Writing Down The Bones” this morning. In the chapter ‘Be Specific’, Natalie Goldberg talks about being precise with description. Name a flower; name a tree. It works with people, too. I could have written the whole piece above talking only of ‘my girlfriend’. And although I haven’t seen Meg in almost thirty years, I think using her name makes this whole piece stronger than it would have been, had I left her unidentified. I was sad to leave Crail and its beach and its wild weather and its harbour where a few boats still landed with a daily catch. A few months later I was living by the sea again but in Crete, where new birds and new plants — and new food and drink — added to my vocabulary. I acted the writer on Crete, too; this time for a whole year. When I next returned to Crail, it was with my wife — Laura — and our first daughter, Isla. It was winter, then, too, and Isla was wrapped in many layers in a small buggy that we pushed up the hill from the harbour and passed the house I had shivered in for many months more than a dozen years before. There is a wee promontory above the harbour at Crail and if you stand on it and brace yourself against the wind you can watch in wonder as the gulls — or Skuas and Fulmars and Herring Gulls — dance on the currents of air and threaten and cajole each other and swoop to their cliff-side nests or dive heroically, their wings tucked back against their sides, into the white-tipped waves. This site is licensed under a Creative Commons Attribution-NonCommercial-ShareAlike 3.0 Unported License by bpodr Ltd · grahamdstewart.com runs on the Genesis Framework.